Continuing our series of desktop GUIs, in this post we are going to go over the topic of building a small hello world program using Python Tkinter. Tkinter is python wrapper/binding to Tk library. Tk was developed as GUI library for Tcl language by John Ousterhout. For many other high level language authors coming to programming scene in 1990s this seemed like easy tool to capitalize on in bringing GUI library to their language. That’s why you can find many different language bindings to Tk. Tk brought easy GUI building to programming masses. Often times many people write off Tk or Tkinter as ugly old GUI library. Their claims are not completely unfounded. But, Tk in recent times made strides to bring modern look by implementing Tile, themeing engine. Tile is also called as ttk. With ttk in place look and feel issues of Tk are addressed. Now, we will go over building a simple hello world program using Tkinter. In this program we will create a simple window with “Hello world” text in it. And a button that say “Kill Me”. Clicking that button will cause the python program to exit. That import * line saves your some typing. This line instantiates Tk and creates main window of the program. Next we create a Label (a widget which displays text ) and call it’s pack method. pack is one three available layout methods provided by Tkinter (rest of the two being grid and place). The widget will not show up until you call pack. Next, we create a Button widget and pack it, similar to that of Label. The interesting point to note while creating button widget is, we provide command argument to it with a reference of sys.exit function. A newbie mistake that is often made is, passing function with () next to it. That will cause the target function to be invoked immediately. You are only supposed to pass the reference of function and Tkinter will call it when button is pressed. So, when this “Kill Me” button is pressed sys.exit will be called and program exits. One, last important line to notice is root.mainloop() . This line sets the event monitoring loop in motion and Tkinter take control of the program from here. Loop or Mainloop as it is called in some GUI libraries is one of the most common element of all GUI programs. In a GUI program this is usually called at the at end of constructing the all the items (widgets) in program. When you call the mainloop, it takes over the control and keeps running until you terminate the GUI. The main purpose of loop is to poll for user input (mouse and keyboard actions) and fire events which your program can handle in asynchronous way. Following diagram explains loop in simple terms. As you can see from the above diagram the GUI loop keeps polling for user input. 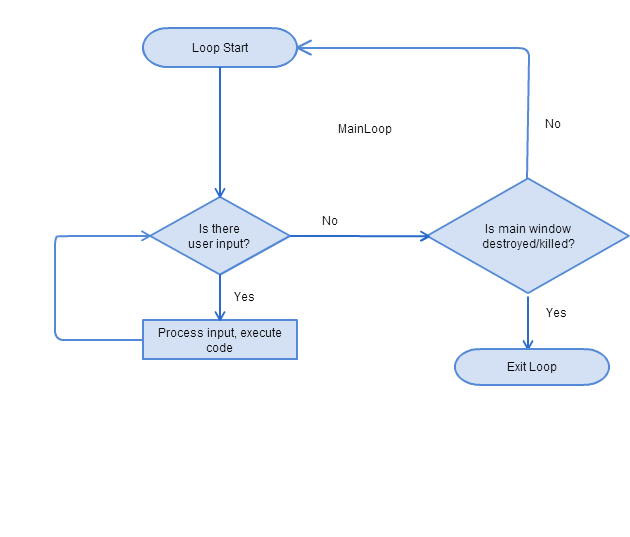 If there is any event via mouse or keyboard or other input devices (joysticks, game pads ) when input is available loop gives control to callback functions that are bound to input events. Loop keeps running until the main window (also called parent window) exits. Once the main window is destroyed the loop exits and gives control back to your code. In most cases end of the mainloop would be end of many GUI programs. GUIs are collection of widgets. 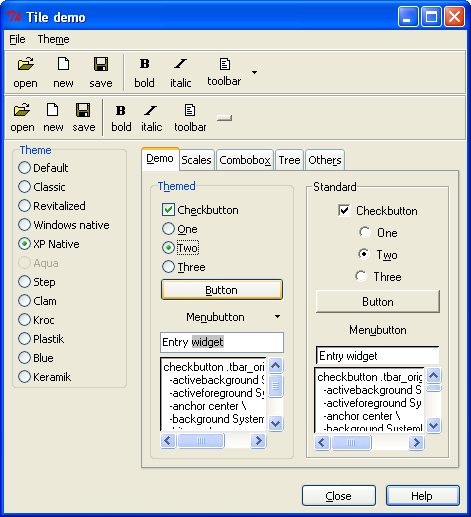 Example of widgets are button, scroll bar, check box etc. Widget is an element of user interaction. Their main purpose is to display or collect information from user. A label displays text to user. A text input widget collects text from user. One way to decide the richness of GUI tool kits is to look at how many widgets they offer. The more widgets a library offers you the better it is for you. So, that you don’t have to write extra code to implement custom widgets. 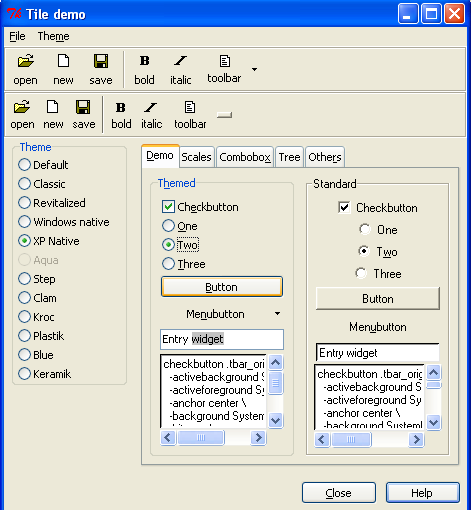 Widgets usually are sub classes of a Widget parent class. So, most of the widgets inherit properties of widget class in respective GUI libraries. 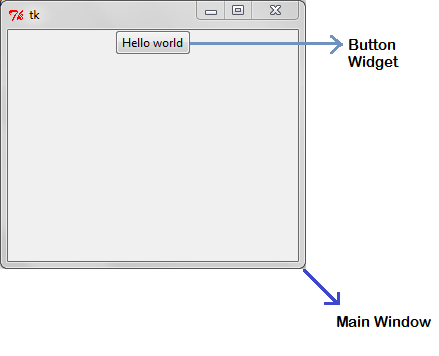 In some GUI libraries main window also has properties of a widget. When ever user presses a button or enters text using keyboard those actions generate events in GUI libraries. GUI libraries provide a way to hook into these events so that your program can respond to user actions. The event hooking/binding style differs from library to library. But, the aim is same across all libs, that is to provide programmer a way to respond to user input. Layout facilities provided by GUI libs helps to make programmer’s life easier when placing widgets in main window. Layouts are simple rules you use to convey to GUI library on how you would like your widgets to be laid out on screen. Instead of manually placing widgets on screen by specifying distance units and placement pixel positions, once you construct your widgets you hand them over to certain layout scheme to let GUI library handle the placement. The benefits are, layouts will take care of expansions, size proportions and other nitty-gritty detail of placing your widgets in orderly way. The layout features provided by libraries vary greatly. You often have to pick the one that suits your needs. These layouts can be mixed in order to achieve the placement and look you want.